The Los Angeles Dodgers are undoubtedly going to the postseason, but for the time being, they have a growing list of injury concerns. With the likes of Clayton Kershaw and Yu Darvish already on the DL, the Dodgers added Alex Wood and Cody Bellinger to the DL Tuesday night. Wood is experiencing inflammation around the joint where the collarbone meets the sternum, while Bellinger has been sidelined with a sprained ankle. Wood is optimistic that he’ll be back soon, although it’s the second time this season an issue with his sternoclavicular joint has sent him to the DL. He also missed 11 games at the end of May into early June. However, Wood does not appear to be overly concerned and believes he’d continue pitching if the Dodgers didn’t have such a substantial lead atop the NL West. Wood is in the midst of a career year. He’s 14-1 with a 2.41 ERA, giving the Dodgers another left-handed ace alongside Kershaw and Rich Hill. He’s been slightly more ordinary since the all-star break, posting a 3.80 ERA in seven starts. But if he’s altering his mechanics because of the injury, time off may be what he needs to get back on track before the playoffs. With Wood joining Kershaw and Darvish on the DL, the Dodgers are down to four pitchers in their rotation, including Brock Stewart, who was called up to start Tuesday’s game against the Pirates. Stewart and Ross Stripling will help fill the void until the Dodgers get some of their starters back from the DL. As for Bellinger, he sprained his ankle during Monday’s game while playing in right field. The Dodgers don’t believe the injury is anything serious. But with sprained ankles being notoriously tricky, the club isn’t taking any chances and is choosing to take the cautious route. With Bellinger out, it’ll give Adrian Gonzalez a chance to play regularly at first base. The veteran returned from the DL last week after an extended absence due to lower back pain. However, Gonzalez struggled to get going earlier this year, and this may be his last chance to get regular playing time this season. 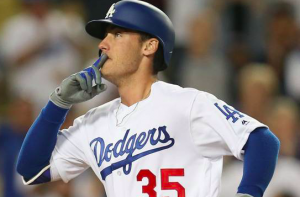 If he continues to struggle, the Dodgers may plant Bellinger at first base when he returns. Meanwhile, Chris Taylor, Curtis Granderson, and Yasiel Puig should all see regular playing time in the outfield, with the Dodgers having little outfield depth beyond that trio. That lack of depth could force the Dodgers to keep Bellinger in the outfield, giving them more reason to make sure his ankle heals properly. If all goes according to plan, both Wood and Bellinger should be back from the DL early in September. However, their absence will test the depth the Dodgers have both on the mound and in the field, which may turn out to be a blessing in disguise later in the season.